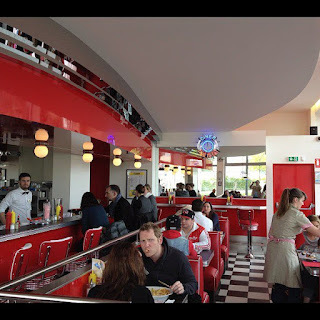 I couldn't believe the news today nor could I close my eyes and make it go away: a full-fledged Diner finally opened its doors in Strasbourg. I had to give it a try and so, it won't come as much of a surprise that a good 22 minutes after Franky's Diner opened I could consider myself one of their first customers. As I'm used to being disappointed by the usual amateurism associated with attempts to recreate true and great American food, I wasn't expecting much. First of all, let me say that I was pleasantly surprised with the setting of this Diner in the sense that it pretty much looks like the real thing. Granted there are no napkin dispensers on the table and we can't choose the music but the seats, color theme & atmosphere makes you feel like you're 5000 miles away from the capital of Europe... Well, as long as you're also not paying much attention to the music: Franky: The Stray Cats formed in 1980 and their music mostly consisted of a blend of rockabilly music with punk elements. It is not the kind of music that is usually played in a Diner. I wish I would have listened to some more appropriate music such as: Chantilly Lace or Purple People Eater for instance. What about the experience ? There is a large selection of beverages. 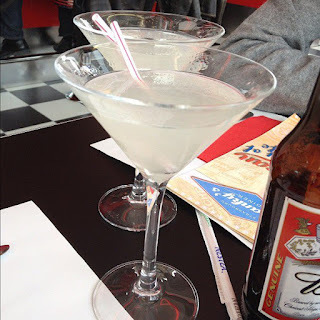 Unexpectedly, there are some not-so-easy-to-find-in-France cocktails such as Martinis and Margaritas. 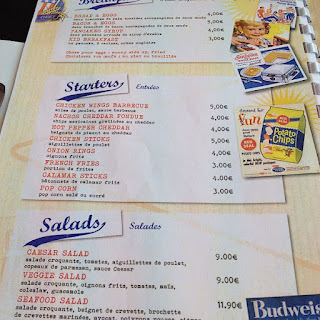 I started off by ordering a Budweiser which was relatively cold (not ice cold like it would be in the U.S. but not as warm as bottled beer is too often served in France). Then, I decided to go for a Margarita: I was not asked which way I wanted it (my preference goes to rock & salt) but was happy to see the bartender use a Boston Shaker to prepare it. Besides the fact that it came in a Martini glass which wasn't salt-rimmed, I must confess that my Margarita was both good and strong. So all in all: the beer was decently cold and the Margarita good but far from perfect. My other complaint would be that while Dr. Pepper is on the menu, there is no root beer (which I love!). 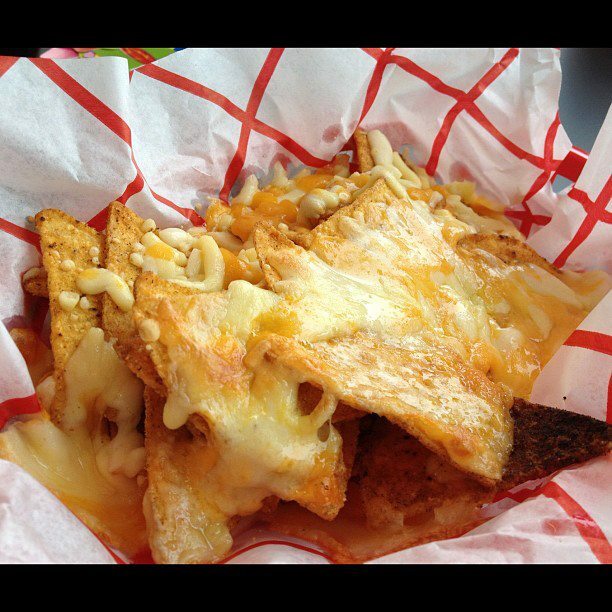 They were much better than they look, though there wasn't much cheese under the first layer of Nachos. They have a good selection of burgers but I was shocked to learn that they only serve rare meat due to the way they prepare it (that is what I was told). I love rare meat but not in a burger and I believe many burger experts will agree with me. This is a bit of an annoying French touch to a supposedly all-American restaurant. First of all, rare meat is hard to find and unlawful in many US states. Second thing, a good burger needs a well done or medium patty. Using rare meat creates an unbalance that in the end is hurtful to the whole burger experience. Granted, some people like their meat rare but why on earth wouldn't you let customers choose the way they want their meat prepared? This question seriously needs to be addressed (and the fact that my comment about this on their facebook page was simply erased). So how was my burger? It was ok good and that's the best way to put it. It wasn't amazing. t wasn't disgusting. The cheddar was of the liquid kind, the tomato consisted of a very thin slice. It certainly does not qualify as the best burger in town despite all the signs pointing to this statement inside the restaurant. Without a doubt, the best paid burger in town is to be found at 231 East St. As for the other kind of burgers (think: free burgers), there only is one alternative in Strasbourg: Share-A-Burger. Well, trying out a restaurant on its opening day is not necessarily the easiest task. I could tell that the staff was overwhelmed by the amount of customers but the good thing is that for the good 3 hours I spent there, the place stayed full with new customers pouring in frequently. Franky's Diner is, without a doubt, the closest thing you can find to a real American Diner in Strasbourg. Although I was disappointed by their burgers, I was happily surprised by the variety of the items on the menu and the size of the place. If you want the atmosphere and ok food then go to Franky's Diner. If you want to have a great burger, go to 231 East Street! and the toilet are ? Could you add a test of the toilet in your studies ? 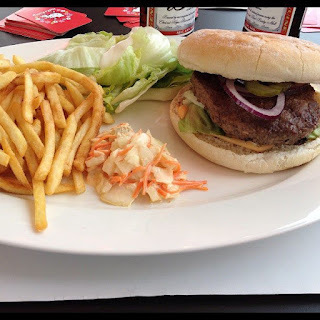 If you like burgers, try Le Pied de mammouth...very tasty! Article assez complet : well done ! Voici le mien sur le meme sujet mais plutot orienté Breakfast ! I have to say i quite disagree with your paper here. Actually not with your comment itself, but the comparaison with the 231ST east street. I was not at franky's opening, but i was for the 231's. And i have to say that 2 weeks after opening, franky has settled much more problems than the 231 did. My meat was not rare, and i thought my burger was delicious. I actually felt like i couldnt do so good at home, unlike when i eat at the 231. A big con of the place that you didnt mention (maybe cause you seemed to eat there at daylight) is the ambiance. I found the orange to red colors quite annoying and the music too loud to speak comfortably with your friends. Thank you all for your constructive comments. 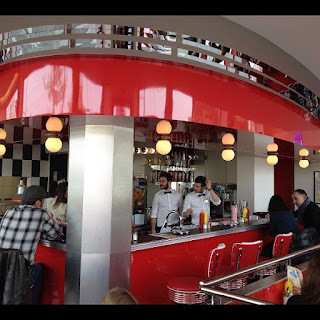 I haven't had a chance to go back to Franky's Diner yet but I will definitely go in the very near future. As for "Le Pied de Mammouth" and 231 East St.: it certainly is a matter of taste. In my experience, I have never been disappointed at 231 East St (and went there on their opening day too). 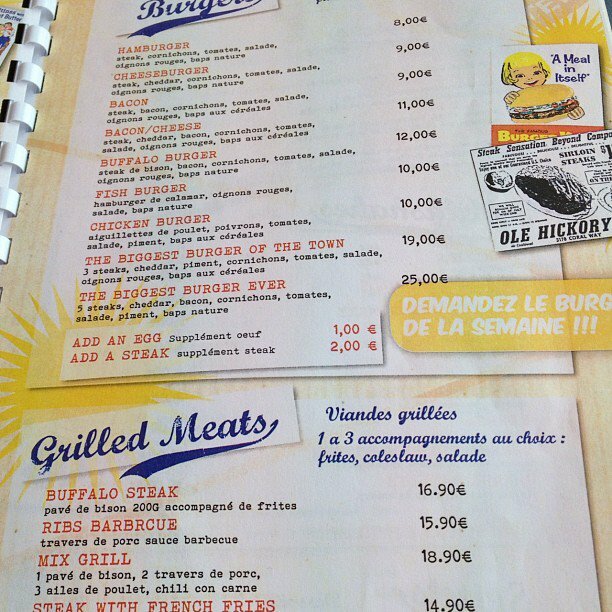 I like "Le Pied de Mammouth" but wouldn't consider this place as a classic Burger joint. It's more like a French interpretation of the Burger concept. Once again, just a matter of taste. On a similar note, I wasn't ecstatic when I tried Bar Boulud's Burger in London though many consider it one of the best burgers in the UK. I guess my preference goes to classic burgers and not French ones. Once again, this is only my opinion and all your thoughts and comments are welcome. I was there yesterday and I have to say that I was really disappointed. The burgers were not that good and expensive (I honestly think I can do better at home, I have an secret for cooking meat which would give you orgasms). Anyway, apart from the burgers part, the fries were just SO bad. It clearly were frozen fries and they taste no better than the mcdonald's ones.. how disappointing! Oh and what did you mean with "not-so-easy-to-find-in-France"? Because you can actually find Martini almost everywhere in the supermarkets. Anyway, good review and I agree on most of your arguments. Never tried the 231 burgers so thanks for the tip. 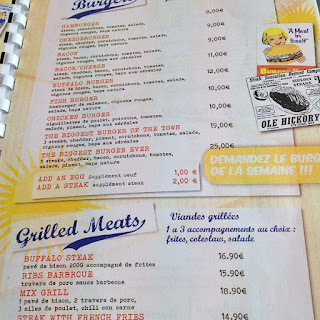 Big Fernand is on my to-do burger list so will definitely try it next time I'm in Paris. Thanks for the tip.